"Wild Days" comes to Seaworld Orlando for the next Three Weekends. Seaworld Orlando's new weekend programing, called "Wild Days", returns it's focus to education, conversation and protection. 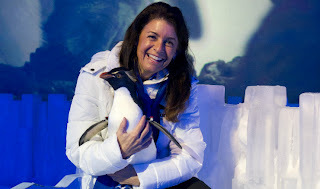 Starting on January 11th, guests can experience interactive and education programing about some of Seaworld Orlando's animal ambassadors as well as everyone's fan favorites. Guest's can meet leaders in animal rescue, education and rehabilitation during this event as well as get up close views of some of the animals. Join “Jungle Jack” for a wild weekend of furry and feathered fun. Recognized around the world for his boundless enthusiasm for animals and conservation, Jack Hanna helps us share in his wondrous connection to wildlife and the world we share. Meet the leaders in the world of animal rescue and rehabilitation as they share incredible stories that have been featured on the national show, Sea Rescue. SeaWorld’s Animal Rescue team is on call 24/7, 365 days a year to help ill or injured animals, and for nearly 40 years the team has rescued more than 22,000 animals. Featured animal rescue stories will include: turtles, flamingos, manatees, pilot whales and dolphins. Penguin Lovers of the world unite! Don’t miss this refreshingly fun and educational weekend centered all around penguins. Join SeaWorld Animal Ambassador Julie Scardina as she shares her lifelong love of animals and the parks’ commitment to wildlife conservation and as well as tell stories of her trips around the globe from continent to continent. Seaworld is also doing a special series of "Trainer Talk" programs, which you can hear from and speak to the animal trainers as well as rescue specialists. Blue Horizon: Join the SeaWorld Animal Training and Rescue Teams to learn more about dolphins from Blue Horizons and the incredible journey of rescue and rehabilitation of four stranded pilot whales. Trainer Talks will take place at the 10:00am, 1:30pm and 5:00pm Blue Horizon shows. Clyde and Seamore Take Pirate Island: Join the SeaWorld Animal Training and Rescue Teams to learn more about dolphins from Blue Horizons and the incredible journey of rescue and rehabilitation of four stranded pilot whales. Trainer Talks will take place at the 11:00am, 2:15pm and 5:15pm Clyde and Seamore Take Pirate Island shows.